today i was at the billings clinic, getting admitted for tomorrow at 12:40 pm. They did an EKG, drew some blood, asked questions and I had a final consult with the young surgeon wonder. He said they will have a pathologist standing by, to check the lime sized monster out ASAP in case surrounding stuff needs to be removed. They said to 2 to 5 days stay, and i asked for a room with a view. Then i was told to go get some sleep, and "see you in the morning'. Tonight i sit at the Country Inns and Suites. The airport is down the road. Im tempted. This all started exactly one month ago. On October 12th I went in for a regular physical. I try to be regular with my exams, because in 2001 I was diagnosed with severe Endometriosis, severe enough to have had a total hysterectomy with endometrial tissue cauterized off of my pelvis walls; all of this putting me in early menopause. 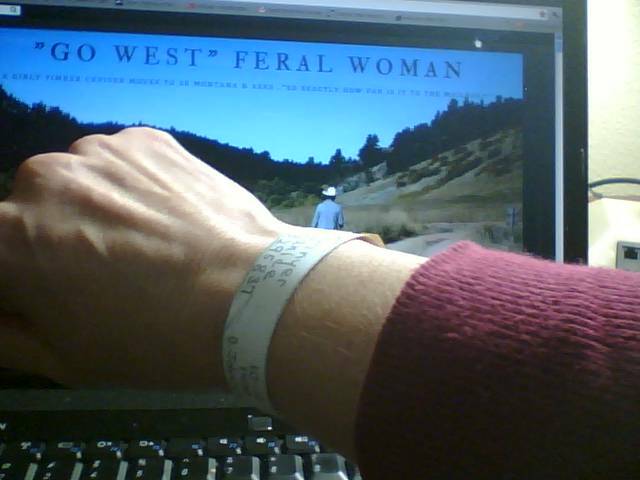 But I am not a disease, i am Gowest Feralwoman, and so I get regular checkups to make sure it stays that way. I try to exercise, eat right, and be conscious of what I do. During my regular annual exam just one month ago, the Doctor felt something, and ordered a C-scan. For some reason i asked the clinic if i could possibly have that scan that day, as i had to go back to work in the Black Hills. For some reason they could fit me in. I drank contrast as fast as I could, and got the IV dye treatment, and laid in a tube. Three days later, while in the Black Hills working, I received a phone call from the Doctor himself, telling me they found a 4 cm lime sized mass. Not where he felt that odd ridge on my left side, but on my right side, near my pelvic rim. "It is so good that you had this scan, to catch it this early." Endometriosis has been linked with Non-Hodgkins Lymphoma. Funny thing is, I dont feel sick. no symptoms. And now I sit, telling myself again that I am not a disease, but Gowest Feralwoman. No matter what they find out tomorrow. Be strong. I'll keep you in my prayers and ask for great miracles for you, steady hands for the surgeon, and for the good Lord to comfort you, and wash you in peace. I just found your blog and also your sad news. I'll be thinking of you this morning and sending you energy. i know you won't read this until later, but i have been sending you love and healing light since last night. may your surgeon wonder and his side-kick pathology man work their hero magic today so you can be WELL on your way! I have no doubt that God will hold you in His arms throughout this ordeal. Be strong-you are a Feralwoman. Prayers and Hugs to you. Like Rubye Jack, I just found your blog, having been sent here by Sheryl's blog. I am seeing your surrounded by the healing white light of Oneness that unites you with all of those who have gone before us and those with whom we live today and those who will come after us. They hold you dear and fast. Well, the procedure is done. I'm praying for good news and wellness for you. This too shall pass. Got that wedding to plan for mama. Sending healings to you and prayers to our almighty Father. I (and all your blogger friends) will be thinking about you and sending positive thoughts and energy. I am reading your blog for the first time. I wish you good luck on your surgery tomorrow. May God keep you and your doctors in his hands. It was fate, how many get that chance to catch their cancer so quickly! Wow, it's pretty scary how this could have gone on unnoticed if you hadn't had the check up when you did. It sounds like all will go well for you & your family. And you have something BIG to look forward too & possible grand children in your future as well! :-)) Hugs! as I am writing this I am hoping that the surgery went well and you are now on the road to recovery!!! Okay, now I see what's happening. I'm keeping you in my prayers! I am new to your blogworld but not new to the world of helping with prayers! Remember to breathe and not let the fear carry you. Just in and out and in and out and soon you will know. Wow- I'm so glad they caught it! Stay positive! I think being a fighter and staying positive is the key. Wishing you complete healing and recovery from this! You are a Gowest Feralwoman! I am thinking of you and praying for you.